I really am so ready to start taking on some springtime recipes with the early vegetables coming out of the gardens and markets. Unfortunately, there is snow on the ground so we will have to continue braising and slow cooking for now. 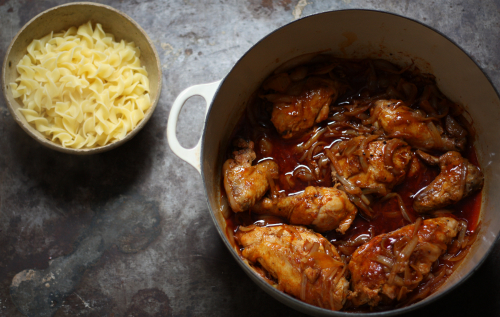 This recipe for Hungarian chicken paprika will not disappoint — with basically 5 ingredients, you can create this meal to satisfy a hungry family of 4. E.A.T. Tip: Buy a whole chicken and cut it up yourself or just take it to the butcher as they will generally cut these up at no additional charge. The ones that are already packaged and cut up are typically more expensive. Salt and pepper chicken pieces well and start by melting 4 tablespoons of butter in a large pan over medium high heat. Cut onions in half and slice long ways about a 1/4 inch thick. Once butter has melted place the chicken skin side down in the pan and let it rest at medium high heat without moving for about 8 minutes. This will sear and brown the skin. Flip and cook the other side until also brown. Remove from the pan to let rest on a plate and leave the drippings in the pan. Add the remaining 2 tablespoons of butter and melt over medium high heat. Once melted add the onions and stir to coat. Mix in paprika and stirring to combine. 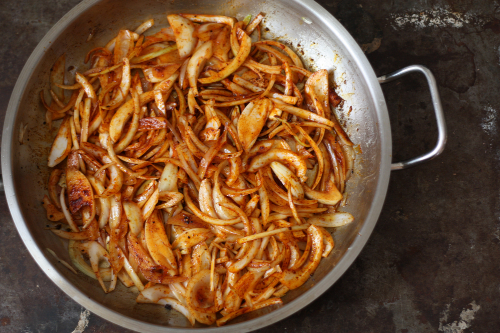 Reduce heat to medium and allow the onions to sweat and soften about 8 minutes, stirring occasionally. 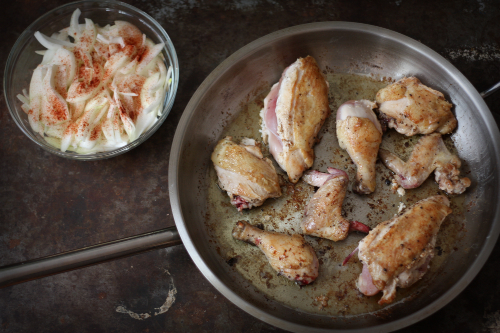 Return the chicken with accumulated juices to the pan and cover — I switched pans forgetting I did not have a cover for the one above. Cook on a low to medium heat allowing the onions and chicken to simmer for 30-40 minutes. 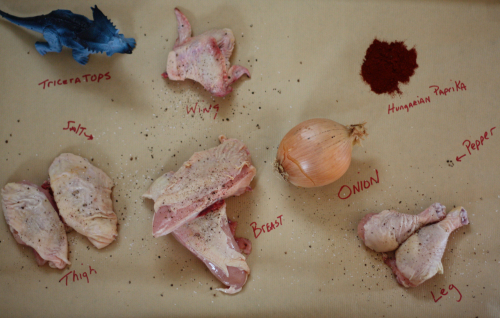 The chicken and the onions will make their own gravy. Prepare noodles or nokedli and portion into bowls. Top with the chicken and gravy. 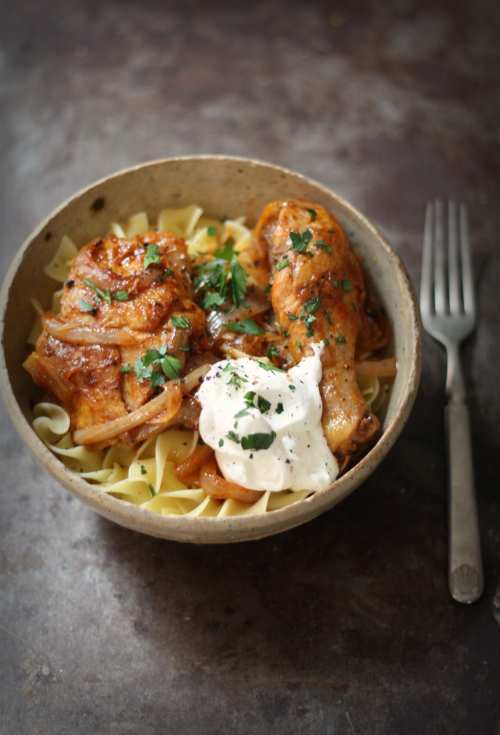 Dollop with sour cream and sprinkle with parsley to garnish. Serve immediately — sit back while your family says köszönöm szépen (thank you very much). My grandfather was a Czech who was apprenticed to a Hungarian butcher. He taught my grandmother to make Chicken Paprikas. We make it the same way you do, except we throw it in the oven so we don't have to worry about it scorching. And we stir the sour cream into the juices. Thanks! Wow an apprentice to a Hungarian butcher. How I would love to have had that old world opportunity. Thanks Jan for commenting. 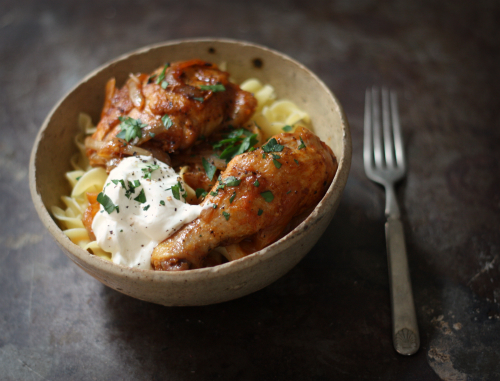 I have a quick question, what is the difference, flavor-wise, between hungarian paprika and regular paprika? I'm wondering whether I need to go out and by myself some before I make this. Well honestly I post a lot about using Hungarian paprika because I feel if I don't my Hungarian grandmother might roll over in her grave! Do know that smoked Spanish paprika is different than sweet Hungarian paprika. Thanks for asking! Yes! I am not even exactly sure why that happened. It just did. No place to print this recipe. Annoying!